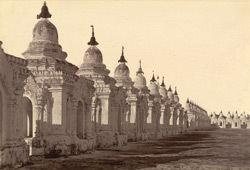 Photograph of shrines in the Kuthodaw Pagoda complex at Mandalay in Burma (Myanmar), taken by Willoughby Wallace Hooper in 1886. The photograph is from a series documenting the Third Anglo-Burmese War (1885-86), published in 1887 as ‘Burmah: a series of one hundred photographs illustrating incidents connected with the British Expeditionary Force to that country, from the embarkation at Madras, 1st Nov, 1885, to the capture of King Theebaw, with many views of Mandalay and surrounding country, native life and industries’. Two editions were issued, one with albumen prints, one with autotypes, along with a set of lantern slides. Hooper made the series while serving as Provost Marshal with the British Expeditionary Force, which entered Mandalay, the Burmese royal capital, on 28 November 1885. King Thibaw (reigned 1878-1885) was deposed and taken prisoner, and a military occupation of the city began. The Kuthodaw Pagoda lies to the north-east of Mandalay at the base of Mandalay Hill. Mandalay was founded in 1857 by King Mindon Min (reigned 1853-78) who shifted his capital here from Amarapura, and the pagoda was erected by him as one of the sacred buildings necessary for the consecration of the new city. The walled complex of the pagoda contains what is popularly described as the world’s largest book. The central stupa is surrounded by 729 small shrines, each containing a marble block on which is carved in Pali script part of the sacred Theravada Buddhist texts. Taken as a whole they comprise the entire Pali canon or Tipitakas (Tripitakas in Sanskrit). Hooper described the stupa and its satellite shrines in a caption accompanying another photograph: “In the centre rises a very finely shaped Pagoda richly gilt all over; this is surrounded by a triple square of shrine-like buildings, each containing a marble slab engraved with a chapter of the “Beetaghat” or Buddhist scriptures. There are altogether some 800 of these, and the top of each is crowned with a gilded Htee with 10 bells on it; these bells have a flat heart-shaped piece of metal attached to the tongue, which is acted on by the wind, so when there is any breeze blowing 8,000 bells are tinkling together, and the effect on a quiet night is very pretty, the whole air seems filled with music.” Hooper was a dedicated amateur photographer and his photographs of the war in Burma are considered “one of the most accomplished and comprehensive records of a nineteenth century military campaign”. The series is also notable for the political scandal which arose following allegations by a journalist that Hooper had acted sadistically in the process of photographing the execution by firing squad of Burmese rebels. The subsequent court of inquiry concluded that he had behaved in a “callous and indecorous” way and the affair raised issues of the ethical role of the photographer in documenting human suffering and the conduct of the British military during a colonial war.